BonELF Wireless Bluetooth Ear-Free Headphones: Free Your Ears. BonELF X Wireless Ear-Free Headphones from AMA Audio are a revolutionary new listening device that blows old-school headphones and earbuds out of the water. Cleverly designed with science in mind, BonELF X doesn't cover or block your ear canals, allowing you to stay in touch with the world and people around you while you stream music from your smart phone via Bluetooth. With its sound transmitters resting just below and behind the temples, BonELF X leverages natural bone conduction to deliver sound waves directly through your skull - so the music you hear is flawless. Whether you're looking to call & talk safely while you drive, enjoy music while working out with your friends, or just listen to streaming media for hours without making your ears sore or irritated, BonELF X's lightweight, cutting-edge design can deliver the performance you need. And with its sleek, unique, and ergonomic style, BonELF X is the hot new tech accessory that looks as good as it sounds. BonELF X works by transmitting sound via bone conduction. Sound waves are carried to the auditory nerve via the bones in your skull, allowing you to hear your music without plugging your ears or blocking environmental noise. BonELF X rests gently against the skin just in front of your ears, delivering wireless, high-quality audio with zero interference, while leaving your ears free. BonELF X Ear-Free Headphones are also wire-free, with no cords or cables to get tangled up. With powerful Bluetooth pairing, you can sync BonELF X to your smart phone or other Bluetooth-enabled device to stream music and other audio media wirelessly. Whether you want to listen to music while you exercise, catch up on podcasts while you work, or talk and call hands-free while driving, BonELF X is ready to keep up with your on-the-go lifestyle. If you've ever wished your life had a soundtrack, BonELF X is the personalized lifestyle gadget for you. 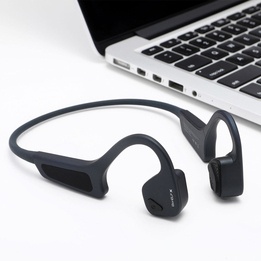 With BonELF X, you can listen to music at work (or in other noisy environments) while also wearing earplugs for hearing protection. This works because BonELF X is ear-free. Now you can finally wear the safety gear management requires while still enjoying pure, clear music. BonELF X's slimline around-the-head design also makes it compatible with hard hats and other headwear. BonELF X can also help you stay in touch: while wearing these wireless ear-free headphones, you can sync them to your smart phone to make sure that whenever someone calls, you're ready to answer. And because the noise is transmitted through bone conduction, you never have to worry about loud ambient or intermittent noise drowning out your calls and alerts. Because BonELF X lets you use earplugs to protect your hearing while you enjoy music at the same time, it's not just great for work! BonELF X is also a strong choice for shooters, as well as for home handywork - and any other loud environment where hearing protection is necessary. If you're here, you already know your standard set of in-ear earbuds is problematic. They usually don't fit perfectly, which means they can't form a good acoustic seal inside the ear canal, so your perceived sound quality suffers. Whether they're the 'buds you got free with your phone or the high-end audiophile earphones you finally splurged on, a poor fit can trash your audio quality. Adding insult to injury, poorly-fitted earbuds often straight-up fall out of your ears - and even if they stay in, the most common problem users experience is that after just a few minutes, they make your ears ache. Over-the-head headphones, which don't go inside the ear canals, are the classic alternative - but these have some issues, too. They have to cover the entire ear or your audio leaks, and just like with poorly-fitted earbuds, the more sound waves escape, the more the quality of your listening experience plummets. But when their ear cups do seal properly all the way around the ear, headphones tend to get hot and sweaty, especially during outdoor use. Too, the weight of a set of ear cups that can keep sound in, seal around the ear, and stay soft enough to be comfortable is significant, explaining why top-quality headphones are often hefty enough to strain your neck or hurt your head. With stylish precision, BonELF X targets and topples each of these problems. BonELF X doesn't go in your ear canals at all, cutting off ear pain at the pass. It also doesn't cover your ears, so you won't have to force yourself to choose between poor-quality sound or sweaty ears. The BonELF X is lightweight and low-profile, so it will never strain your neck. And because this ear-free headphone transmits sound directly through your skull, it won't allow for the kind of audio leakage you can suffer from with old-style earbuds and headphones. BonELF X's bleeding-edge design sails over every hurdle. Whether your first concern is your comfort or your sound quality, BonELF X is driving up the bar for how good personal listening can feel. When BonELF X raised the standard, it became clear: regular old-fashioned headphones and earbuds just can't compete. Is Wearing Headphones While You Drive Illegal? In several states in the US, wearing earbuds or headphones while driving is illegal. Covering your ears while you're behind the wheel can get you in big trouble with the law - and in many places, the penalties can apply even if you're just wearing one little earpiece to take a call. For example, in New York, driving while wearing headphones is a "primary offense" that can get you stopped by the cops, fined up to $150, and even jailed for 30 days. If you're thinking that sounds harsh: it is. The logic behind these restrictions is that wearing headphones or earphones can make it impossible to hear traffic, horns, and sirens - an argument that, for the most part, makes sense. If you can't hear alarms, you may not be able to react quickly enough when crashes and other hazards arise. Whether driving while wearing headphones is legal in your state or not, it's not a great idea. Being able to hear that one last-second shout could literally save a life. So you don't want to break the law, but there are a lot of good reasons you might legitimately need to be able to access your own personal audio while you're on the road. If nothing else, you need a way to take calls that doesn't force you to take your hands off the wheel. But if you can't wear headphones while you drive, the only alternative has historically been to send your audio signal through your car stereo... which becomes a big problem when you're trying to talk on the phone. So what do you do? Do you break the law, and risk a ticket or worse? Or do you suffer through the minefield of letting everyone else in the car (or on your street...) listen in on your personal conversation? It's an ugly choice to have to make. BonELF X lets you call and talk freely and privately, without covering your ears, and without broadcasting your music and conversations for everyone else in the car to hear. In fact, BonELF X was initially conceived to solve this exact problem: these ear-free, hands-free headphones let you enjoy the freedom of wireless audio, the privacy of personal listening, and the open, uncovered ears required to stay safe - and legal - while you drive. The BonELF X is also perfect for cycling, walking, hiking, climbing, and running. Your ears stay free to breathe, and you can clearly hear everything around you even while you take in a new album or podcast. The result is that you stay safer while you navigate traffic, travel, or exercise. You can also hear voices clearly while wearing BonELF X, which makes it possible to stay in touch with the people around you. Whether you're jogging with your friends or keeping an eye on your kids at the park, BonELF X lets you listen to music and hold a conversation at the same time. Multi-tasking has never sounded so good. Choose BonELF X to elevate your driving, working out, commuting, hiking, and exploring. BonELF X has simple controls for power, pairing with a Bluetooth device, answering/declining/ending calls, volume control, track skipping, and redial. BonELF X can stream audio via Bluetooth for six hours on a single charge. 2-3 hour charge time. BonELF X will also automatically power down if it's been disconnected from your smart phone for 10 minutes, helping to save power and extend battery life between uses. BonELF X: Your Ears Deserve It.